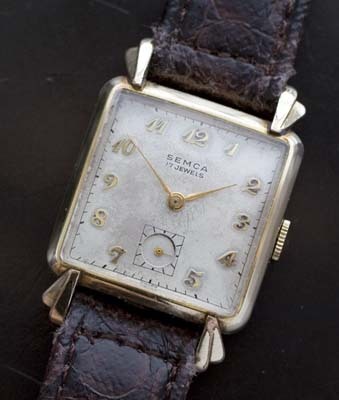 A square cased vintage watch with sub-seconds dial and 17 jewel Swiss movement. 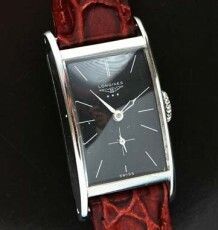 Great value for someone looking for a wonderful design with a sophisticated Swiss movement. 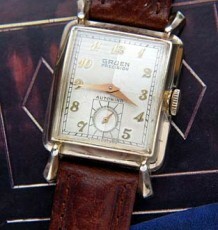 The watch features a gold filled case with lugs that flare out and step away from the square case. The all original dial has some antique patina in the middle of the dial which jut adds to the overall vintage look of this reasonably price mechanical watch. 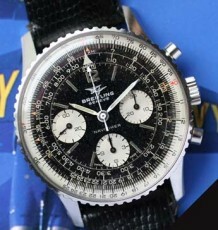 Collectors will note that the watch uses the separate sub-seconds register located at the bottom of the dial. 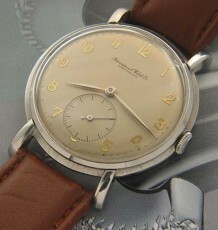 Fitted in the watch is a 17 jewel Semca signed Swiss movement that was just serviced and is keeping great time. The watch measures 26 mm wide by 37 mm long.